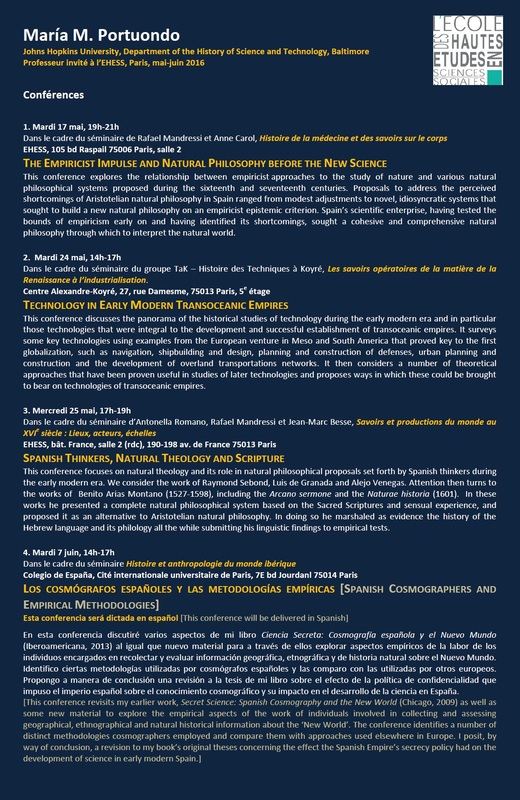 This conference explores the relationship between empiricist approaches to the study of nature and various natural philosophical systems proposed during the sixteenth and seventeenth centuries. Proposals to address the perceived shortcomings of Aristotelian natural philosophy in Spain ranged from modest adjustments to novel, idiosyncratic systems that sought to build a new natural philosophy on an empiricist epistemic criterion. Spain’s scientific enterprise, having tested the bounds of empiricism early on and having identified its shortcomings, sought a cohesive and comprehensive natural philosophy through which to interpret the natural world. Dans le cadre du séminaire du groupe TaK – Histoire des Techniques à Koyré,Les savoirs opératoires de la matière de la Renaissance à l’industrialisation. This conference discusses the panorama of the historical studies of technology during the early modern era and in particular those technologies that were integral to the development and successful establishment of transoceanic empires. It surveys some key technologies using examples from the European venture in Meso and South America that proved key to the first globalization, such as navigation, shipbuilding and design, planning and construction of defenses, urban planning and construction and the development of overland transportations networks. It then considers a number of theoretical approaches that have been proven useful in studies of later technologies and proposes ways in which these could be brought to bear on technologies of transoceanic empires. This conference focuses on natural theology and its role in natural philosophical proposals set forth by Spanish thinkers during the early modern era. We consider the work of Raymond Sebond, Luis de Granada and Alejo Venegas. Attention then turns to the works of Benito Arias Montano (1527-1598), including the Arcano sermone and the Naturae historia (1601). In these works he presented a complete natural philosophical system based on the Sacred Scriptures and sensual experience, andproposedit as an alternative to Aristotelian natural philosophy. In doing so he marshaled as evidence the history of the Hebrew language and its philologyall the while submittinghis linguistic findingsto empirical tests. En esta conferencia discutiré varios aspectos de mi libro Ciencia Secreta: Cosmografía española y el Nuevo Mundo (Iberoamericana, 2013) al igual que nuevo material para a través de ellos explorar aspectos empíricos de la labor de los individuos encargados en recolectar y evaluar información geográfica, etnográfica y de historia natural sobre el Nuevo Mundo. Identifico ciertas metodologías utilizadas por cosmógrafos españoles y las comparo con las utilizadas por otros europeos. Propongo a manera de conclusión una revisión a la tesis de mi libro sobre el efecto de la política de confidencialidad que impuso el imperio español sobre el conocimiento cosmográfico y su impacto en el desarrollo de la ciencia en España.